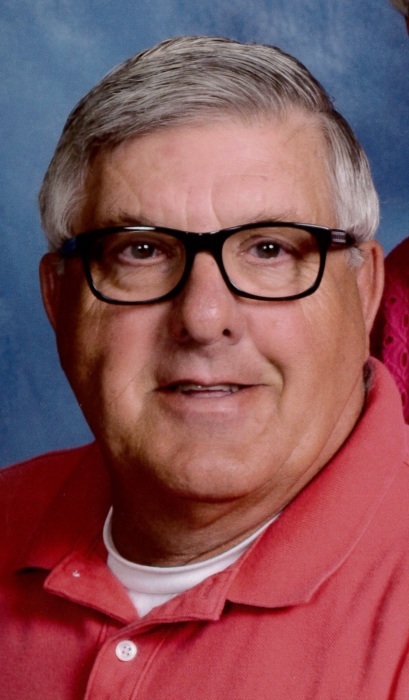 Douglas L. Kelley Sr. 74, of Auburn, died Wednesday April 10, 2019 at his home in Auburn. Doug was born May 2, 1944 in Bryan, Ohio, a son of the late Lowell and Doris Kelley. Doug was a graduate of Bryan High School and had participated in track, football and the orchestra. After high school, Doug joined the United States National Guard and was stationed in South Carolina. Early on in Doug’s career he had worked in management at supermarkets and then left to work at Vulcraft and then later on he went to work at Guardian Industries where he retired. He was a member of Immaculate Conception Catholic Church and enjoyed DeKalb High School Basketball and was an Indiana University Basketball fan. He is survived by his wife, Susan Kelley of Auburn; sons and daughter-in-law, Brian Kelley of Auburn, and Doug and Amanda Kelley of Auburn; daughter and son-in-law, Ann and Jamie Forrest of Ashley; grandchildren, Stephan (Abby) Kelley, Kristen Forrest, Kendall Kelley, Cameron Kelley, Carson Forrest, Bethany Kelley, Jacob Kelley, and Olivia Kelley; great grandchildren, Kora Kelley and Luca Kelley. He was preceded in death by his parents; a brother, Robert Kelley; and a sister, Beverly Kelley. Mass of Christian burial will be held 11:00 am Monday with visitation one hour prior at Immaculate Conception Catholic Church 500 E. Seventh Street, Auburn. Rev. Timothy Wrozek will be officiating. Visitation will be held Sunday from 2-6 p.m. at Pinnington Funeral & Cremation Services 502 N. Main Street, Auburn. Burial will be held in Immaculate Conception Catholic Cemetery, Auburn. Memorial donations may be made to the choice of the donor. Life Story of Douglas L. Kelley Sr. Generous and hardworking, Douglas L. Kelley Sr. lived a life rich in family and friends. Fueled by a strong work ethic and commitment to care well for those he loved, Doug did his best to ensure others well being and happiness. A devoted husband, father, grandfather, and friend, Doug was revered by many and will long be held in the hearts of those who were blessed to share in his life. 1944 marked a time when all American lives were directly impacted by the war effort in Europe. While countless young people actively served in the trenches of WWII, those who remained stateside poured their energies into supporting the war effort in any way they could. As Americans welcomed the end of meat rationing and began planting Victory Gardens, Franklin D. Roosevelt signed the G.I. Bill and soon became the only U.S. president to be elected to a fourth term. As the nation looked toward peace, Lowell and Doris Kelley celebrated their own hopes for the future as they welcomed their son Douglas into their hearts and home on May 2nd. Doug grew up in Northwest Ohio, in the town of Bryan. Here he enjoyed the comforts of a typical childhood filled with time outdoors, great music, sports, and family values. With the death upon birth of his sister, Beverly, the family knew first hand the power of great loss and the importance of celebrating each moment. Doug also enjoyed the comforts of growing up in the good company of his brother Robert. A graduate of Bryan High School, Doug played football and participated on the track team and held the school’s pole vault record for many years. He also played violin in the school orchestra. After high school, Doug joined the United States National Guard and was stationed in South Carolina. One fateful night while attending a dance at Stark’s Dance Hall outside of Bryan, Ohio, Doug had the good fortune dancing with the woman he would one day marry. During the dance, he learned that Sue was from Auburn, Indiana. Determined to find the young woman who already had his heart, he drove around the city of Auburn in his loud car until he found her and promptly requested a date. It didn’t take long for the happy pair to begin setting eyes on a future spent together. The couple settled in Auburn, Indiana where they were blessed to welcome and raise three beautiful children; Brian, Doug, and Ann. Doug was a proud father who supported his children in all of their endeavors. A passionate father and fan, he was often the loudest voice in the stands at their sporting events. Never shy to express his opinions of the play or the officiating, he once found himself tossed out of the stands of a Little League game at Thomas Park. After quickly taking up his new position across the street he continued to give the umpires a hard time for the rest of the game. After he got glasses, he came to love holding them up in the air and asking referees if they needed to borrow them, and his shout to his son to “rebound” literally bounced off the gymnasium walls. Doug possessed a similar passion for NASCAR and his favorite driver, Richard Petty. He was also an avid fan of Indiana University Basketball and of coach Bobby Knight. He loved attending the boys' basketball games at DeKalb High School where he held season tickets since 1984. When not cheering on his favorite driver and athletes, he liked to go to the cruise-ins in downtown Auburn as well as to the area car shows. One of his favorite traditions was to fire up the grill and have people over for the Auburn Cord Duesenberg Festival’s Parade of Classics as it passed by the front of his house. Doug’s enthusiasm included the thrill of going to Cedar Point Amusement Park and riding all of the roller coasters. Once while riding a roller coaster at The Fun Spot in Angola, his smiling, waving, and good time inspired the ride operator to let the ride go longer than usual. It ended up not being such a good idea for Doug as he got off the ride not feeling so well. Early on in his career, Doug worked in supermarket management. Eventually, he found work in manufacturing, first at Vulcraft and then, later on, at Guardian Industries where he worked until he retired. A hard worker, Doug thrived on organization, and he never shied away from a challenge. With signature drive, Doug’s home was always tidy. He loved to work in the yard and tending his flowers just as much as he enjoyed spending time on his front porch. Doug relished in Sunday dinners and celebrating holidays with his family in his home. There was always an abundance of food and plenty of good times. Christmas was his favorite holiday. He loved to dress up as Santa and earned the nickname “Mr. Santa.” He took great care in decking out the house, and his light display was epic. Despite trying to outdo his dad’s light display one year, Brian quickly learned his dad was indeed the master illuminator. Without a doubt, Doug’s greatest source of pride was his family. He was a good son. After his father’s passing, he moved his mother to Auburn where he looked after her. His greatest joy was his grandchildren. He cared deeply for them and spent many hours proudly attending their sporting events and dance recitals. In his eyes, they always knew they were a star and that they always had a super fan on their side. Certainly, Doug’s departure leaves us stunned and saddened. May we find comfort in our many sweet memories of the good man we had the privilege of knowing. With each kindness we extend another, Christmas decoration we hang, cruise we take in our car, and evening we spend on the porch with a loved one, we celebrate the spirit of Doug’s legacy in our own lives. In so doing, he will continue to inspire others as he so inspired us.